Jon Ronson is either your dream or nightmare dinner party guest. He would have endless stories about the strangest elements of society: He has written about psychopaths, conspiracy theorists, and new age militants just to name a few. He’d provide the kind of conversation that pairs well any cuisine as long as it’s served with a bit too much wine. If you’re looking for your cooking to be the main attraction you’d be hard-pressed to compete with the characters and certified wackos that he’s spent quality time with, but for his latest book, So You’ve Been Publicly Shamed (SYBPS), he turns his attention to the most ubiquitous element of society…the internet. Ronson makes the case that the internet, the world’s most common denominator, is also adding new fuel to an act that existed long before dial-up: the act of public shaming. Where as the public shamings of yesteryears were real events held in dramatic settings (i.e. town squares or wood-paneled courtrooms), Ronson’s book illustrates that the public shakings of today are so casual that we may not even know we’re participating in them. A tweet, a reblog, or an article share on Facebook can contribute to someone’s epic downfall. The examples in SYBPS are a veritable “Where Are They Now” of the one-hit wonder viral Internet stories of the past few years. The book starts with Jonah Lehrer, the pop-science phenomenon whose shaming included allegedly plagiarizing his own work and his apology speech. Ronson spends time with Justine Sacco, the infamous PR executive who made a near-fatally unfunny joke about AIDS on Twitter. Her destruction spread during her 10+ hour flight to South Africa, allowing her the unique experience of showing up late to her own public demise. In these and the other examples in the book, Ronson meets with the “victims” post-shaming to hear their side of the story. Although it’s not a one-sided sympathetic approach, he often traces back the shaming to as close to the originator as possible and then looks at the whole picture through a lens of societal scrutiny. The investigation occasionally goes offline as well, but the real excitement is in the digital examples that Ronson explores in a very personal way. Beyond the stories and subject he scrutinizes, it’s the tone and approach of Ronson that makes him (open invite!) the perfect dinner guest; he lays out his thought process clearly, casually, and logically. His goal doesn’t seem to arrive at a grand judgment or conclusion, it’s more to examine the human elements of an unusual situation without a hint of Hallmark histrionics. There’s a reason he’s been a regular guest on The Daily Show — he and Jon Stewart share an approachable satiric logic that makes their stories not just digestible but enjoyable. There are greater issues, wider debates, and bigger arguments to be made about the culture of shaming. A month or so ago it was Brian Williams, the other day it was Conan O’Brien twitter-shaming one of his Conan writers, and tomorrow and the following week we’ll have new examples. But what Ronson and his book do so effectively is make the conversation around it seem a bit more complete, a bit more whole and a bit less anonymous. 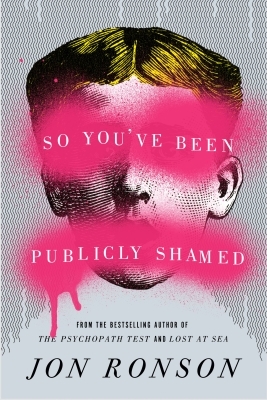 Ronson would probably be the first to tell you his book is not the complete authority on the issue of public shaming but like his other books and investigations, it feels new, relevant, and endlessly entertaining. I’ve already been peppering pieces of it into my own dinner conversations. Now that I admit it, I anxiously await my own shaming.